• Hard coral are the builders of the coral reefs and create a complex habitat that provides a home for many marine organisms. They need a hard surface to grow on, and grow in a variety of shapes including branching, massive (boulder), plates and an encrusting layer. • The hard coral generates a calcium carbonate skeleton that creates the structure of the reef. Without hard coral continually growing and building a skeleton the reef structure would erode away. So live hard coral is an essential part of a healthy coral reef. • Hard coral structures are actually made up of many individual animals called polyps which live together forming coral colonies. These individual polyps have their own tentacles, mouth, stomach and reproductive organs. • Most of the corals’ energy is obtained from tiny algae called zooxanthellae that actually live inside the polyps and produce food from sunlight (photosynthesis). In return the algae are provided with a safe place to live; this is called a symbiotic relationship. Most hard corals also feed at night by catching small animals that float by in the water column (zooplankton), although this food intake only provides a small fraction of their total energy. • Hard coral need certain conditions to thrive which include; clear nutrient-free water, temperatures between 18°C and 29°C, a certain salinity 32-42 ppm and access to sunlight (for the zooxanthellae to photosynthesize). • Hard coral reproduce in two different ways; via asexual reproduction where polyps split into 2 forming identical clones which slowly move apart and secrete new skeleton; and sexual spawning which on the Great Barrier Reef happens in November near the full moon. • Hard coral around the world is under threat from global warming as seas warm above temperatures that coral can survive at. High sea temperatures stress corals which results in them expelling their zooxanthellae. If the stressor is removed the coral can recover by taking in zooxanthellae, although if the stressor remains the coral will die. 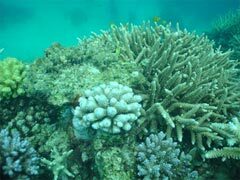 • Reef Check Australia identify and monitor hard coral. We record the following types of hard coral categories; Branching Hard Coral(HCBR), Massive Hard Coral (HCM), Foliose Hard Coral (HCF), Plate Hard Coral (HCP), Encrusting Hard Coral(HCE), and Bleached Hard Coral (HCB). We record and monitor the amount of these types of hard coral because they are reef builders. They are responsible for the reef staying in place in the water rather than being eroded by physical and biological activities. The topography that hard corals form provides a refuge to reef fish and invertebrates. Interesting Fact: Coral polyps produce pigments, which give them very good protection from UV rays, and scientists are currently using these to try to create natural sunscreens for human use.